An effective bomb for a flea-infested room, the Hot Shot Bedbug and Flea Fogger won’t disappoint. We love the overall effects of this product. Foggers are great, but they tend to leave funky smells due to the chemicals and ingredients used. This fogger is awesome because it neutralizes odors and eliminates those smells. For larger rooms, we recommend this fogger. It covers up to 2,000 cubic feet and comes with three cans for widespread protection. Fleas are known for infesting pets like dogs and cats. However, fleas do not discriminate—they will feed on humans as well as your pets. While it’s easy to feel sorry for your fur babies, it’s also important to protect yourself, your home, and your family. There are many ways to get rid of fleas and to further protect your household, and one of those ways is flea bombs. Flea bombs release pesticides within an area to kill the fleas. This solution is effective for after a flea infestation has happened. If your pets have fleas, the treatment shouldn’t stop with them; the treatment needs to extend to your home to completely overtake the problem. Below we have reviewed a few of the top flea bomb products for your use. Kills fleas, ticks, bedbugs, and lice on contact. Cannot be used near open flames or food. Cannot be used around pets. People and pets cannot be in room during treatment. 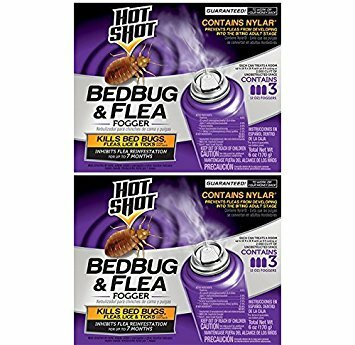 To effectively treat an entire room and rid yourself of fleas, Hot Shot Bedbug and Flea Fogger is a great option. One pack contains three fogger cans, and just one of these cans can treat a whole room. The active ingredients effectively kill fleas, ticks, lice, and bed bugs on contact. The fog is a great option because it reaches all the cracks and crevices in the room. The residual effect of this formula prevents fleas from re-infesting for up to 7 months by preventing new fleas from developing into adults, giving you long-lasting protection. The main benefit of this fogger is that is will even seep into carpets, rugs, drapes, and furniture. 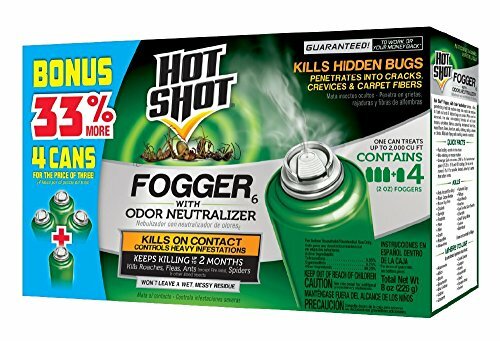 These foggers will leave no spot untouched, so you can be confident that every flea is eliminated. Kills fleas, roaches, ants, flies, etc. Kills bugs you don’t see. Reaches all cracks and crevices. Residual effects last two months. Cannot be used around pets or food. Must vacate the room while in use and afterward. 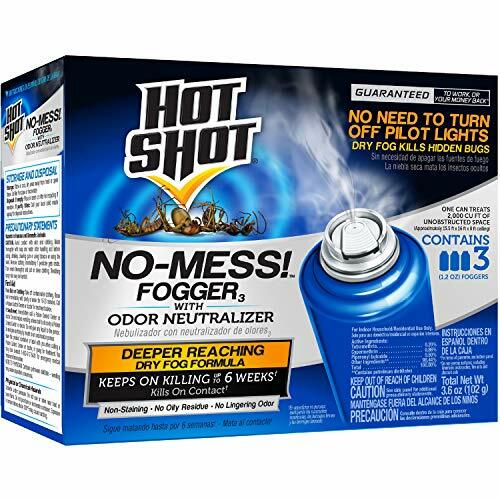 Hot Shot Fogger is a quick and easy way to get rid of the flea problem in your home. The fog coming from these cans will extend to every corner of the room, including all those cracks and crevices you can’t get to with other products. The effective formula kills fleas while giving you long-term protection for as long as two months. This fogger is great because it won’t leave any messy residue and it won’t stain your furniture or belongings. Additionally, this particular fogger features an odor neutralizer to ensure you are not left with a nasty, chemical smell that other products may give you. Interrupts flea life cycle for future prevention. No sticky mess or residue. Kills for 6 weeks after treatment. Cannot be used around pets and people. The Hot Shot No-Mess! Fogger With Odor Neutralizer is an excellent fogger for larger rooms. Just one can of this fogger cover up to 2,000 cubic feet of space, making it great for bigger spaces. With three cans in one pack, you will be able to treat large portions of your home. This formula will effectively kill adult fleas and ticks. At the same time, it interrupts the flea life cycle to ensure all larvae and eggs are killed before they reach the adult phase. This odor neutralizing formula is long-lasting and kills for up to six weeks after initial treatment. It is safe for your furniture and belongings as it leaves no sticky residue and doesn’t stain or leave a mess. The fogger will reach the cracks and crevices of your home. Once an infestation has made its home on your pets, it’s likely that it will spread to areas of your home. Fleas are not just an annoyance to your pets. They also impose risks to you and your family. Once an infestation has made its home on your pets, it’s likely that it will spread to areas of your home. It is very important that you not only take steps to disinfect your pets, but you also clean your home. Read on to learn more about fleas and how they can affect your home and family. Knowledge is key to defeating nasty pests like these. Fleas feed on warm-blooded animals. Most commonly, we find them on household pets like cats and dogs. In fact, out of the many different species in the world, the most common kind is the “cat flea.” While the name suggests otherwise, the cat flea does not discriminate; it will infest both dogs and cats. Even though fleas are mainly found in pets, they can also be found in humans. When a flea inhabits a mammal, the begin to feed almost immediately. They will have as many as 10-15 meals every day. Shortly after that, females will begin to lay eggs. Females can lay as many as 40 to 50 eggs every day adding up to more than 2,000 eggs in their lifetime. It takes about 21 to 28 days for fleas to mature into adults fully. For this reason, you will see that many flea treatments have long-lasting effects for as many as 28 days. A flea typically lives for two to three months. However, some will live for as long as a year. Fleas are known to excrete dried blood. This may seem like useless knowledge, but that excretion is what young fleas will feed on. This is important to know because if you don’t properly clean your pets or home, the dried blood excretion will remain and will feed future generations of fleas. Fleas don’t just bite and leave annoying and irritating marks on your pets. They can cause allergies in your pets, and in some severe cases can even cause anemia. Fleas can also cause harm to humans. Many fleas carry diseases. When a flea bites a human, they can transmit these diseases. Additionally, some fleas also carry tapeworms. Animals, especially cats, can ingest fleas who have tapeworms and end up with tapeworms in their intestines. This can also happen to humans. Once an infestation gets started, it can be hard to conquer. Fleas only typically live a couple of months, but they lay so many eggs that an infestation can last even longer. A few simple tips can help you control and eliminate flea infestations. Maintaining general cleanliness in your home is essential. Even after eliminating the problem from your pets, there can still be fleas in your home. Use a strong vacuum and make sure you clean on and around furniture and carpets. In addition to a vacuum, you may want to invest in a steam cleaner. Steam cleaners are a good way to eliminate insects such as fleas. In fact, there are even special steam cleaners that are designed to kill fleas, ticks, etc. Maintain the same cleanliness for your pets that you do for your home. This means you should regularly clean pet beds, any blankets they use, and their food dishes regularly.